Mom and I are on a diet. Please don't panic. This does not mean that we are going to stop eating out on Saturdays. It only means that we are going to be following a strict plan during the other six days of the week. Mom saw a diet in a magazine that showcased the benefits of adding soy and whey to your diet (20 grams each per day). Since neither Mom nor I have ever had soy or whey before, we decided to follow this plan. It seemed easy, and the woman who followed it lost over 400 lbs. Wow!! Shopping for soy and whey seemed to be a bit of a challenge. However, I spotted the Bolthouse Farms display in the produce section of Whole Foods and noticed that they have soy and whey drinks already made (from their Perfectly Protein line). The down side is that they cost $4 each (for the liter bottles). Hell bent on following this plan, Mom and I grabbed a handful of bottles and a couple of snacks and headed for home. We started this plan on Tuesday, April 22. As of Saturday, April 26, Mom has lost eight pounds and I have lost seven. THE VERDICT: The shakes are ... GOOD!!! Thank GOD! If they sucked, we would have found it really hard to continue this plan for a second week. Although the magazine did not suggest using Bolthouse, we are more than happy to keep buying these delicious drinks. The vanilla chai soy and the mocha cappuccino whey shakes are cool, refreshing, and available in your local supermarket. They also have a second whey shake that is hazelnut latte flavored - can't wait to try that one! Since the diet calls for 20g of soy and whey each, we purchase the liter bottles - which contains 42g of protein - and split them in half. Honestly, you would not be able to tell that this drink is good for you. After mixing it with fruit, it tastes like a milkshake. However, on its own (and I've had a few straight before), it's just as good. For all you nosey people out there, here is the plan that Mom and I are currently following. Now remember, this is not a lifestyle. We are only doing this to take some weight off, so please save your "you can't live like that forever" comments. We get it. 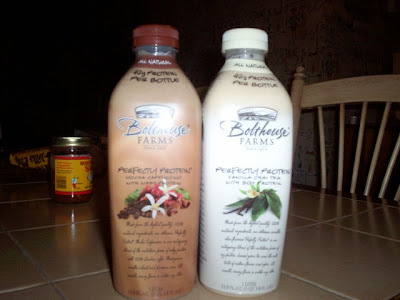 7 a.m. breakfast: Bolthouse Farms soy shake with 20g of protein mixed with 1/2 cup of fruit. 1 p.m. lunch: Bolthouse Farms whey shake with 20g of protein mixed with 1/2 cup of fruit. 7 p.m. dinner: Lean Cuisine, Weight Watchers, or Healthy Choice meal with 20g of protein and less than 300 calories. *The snacks that we've been having are: 60 baby Goldfish crackers; an apple with two teaspoons of peanut butter; a half cup of carrots, three ounces of cottage cheese, and three wheat crackers; and a piece of fruit with 10 almonds (or cashews).